Mourning Wolf is a small, versatile, and heavily armed warship. With multiple anti-ship weapons, missile launchers, and a dedicated fighter wing, she is capable of fulfilling several roles on the battlefield. Mourning Wolf is 274 feet long and has a volume of 5676 register tons. In her standard configuration she carries 20 crew (14 human and 6 synthetic). She and her sisters are light, destroyer class ships. While they can operate independently, the excel when operating as a pack. With the two poster images laid end to end, all three decks can be displayed in one seamless map. Whether the players are aboard as command, crew, or unwelcome guests, this ship will provide a detailed setting to help bring your story to life. This ship is taken from the "Wolves of Albion" issue of 0 hr Armada Codex, also for sale here at RPGNow. That product provides details about this ship and a couple of variants. It also includes miniature-scale deckplans (on a plain white background) broken into pages for printing. 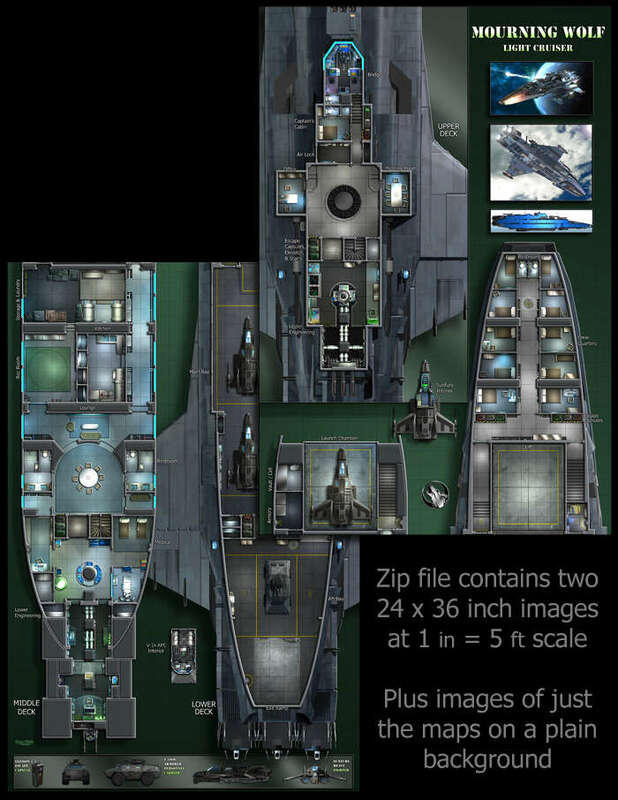 Demo documents and sample art for every Future Armada ship are available at 0-hr.com .